Stable carbon isotope analysis of pollen is useful for understanding moisture availability - that is, precipitation levels and/or aridity. During photosynthesis (for C3 plants), plants take in atmospheric carbon dioxide (CO2) through leaf stomata - small pores in plant leaves. Stomata also regulate water loss (transpiration), so when stomata are open to take in CO2, they are also losing water. In drier conditions, plants reduce water loss by closing stomata. This has the effect of reducing CO2 intake. Carbon (C) has two stable stable isotopes as found in nature: 12C which makes up about 98.9% of all C, and 13C which makes up about 1.1% of C. So, the carbon in CO2 could either be 12C or 13C. When leaf stomata are open, 12C and 13C flow freely in and out of the leaf, and photosynthesis "favours" the use of 12C over 13C since it is the lighter isotope. When leaf stomata are closed, carbon becomes "trapped" inside the leaf spaces, particularly the heavier isotope 13C, so the natural ratio of 12C to 13C changes. Consequently, more 13C is used for photosynthesis. Therefore, plant mass comprised of carbon which has a higher abundance of the heavy isotope 13C, would be due to drier conditions, because the plant was restricting transpiration to reduce water loss. We can measure the ratio of 12C to 13C in plant material such as pollen, and use this to determine climate/environmental conditions through modern calibration studies. Of course, the process is much more complicated and many other factors can influence the carbon isotope ratio in plants. You can read more about carbon isotopes and photosynthesis on Wikipedia. Or, you can read more in chapter 4 of my thesis (open access). We carried out stable carbon isotope analysis on modern pollen (and sporopollenin) from Atlas cedar trees growing in Morocco, Europe and USA, to understand the relationships between the isotopic ratio (δ13C) and environmental moisture availability. We looked at precipitation and aridity (scPDSI). Because the source of carbon in plants is atmospheric CO2, and because we know that the δ13C of CO2 has changed over time, and because the abundance of CO2 in the atmosphere has also changed, we converted the δ13C results to "discrimination" (Δ13C) to correct for these changes, after Schubert & Jahren (2012), and Schubert & Jahren (2015). 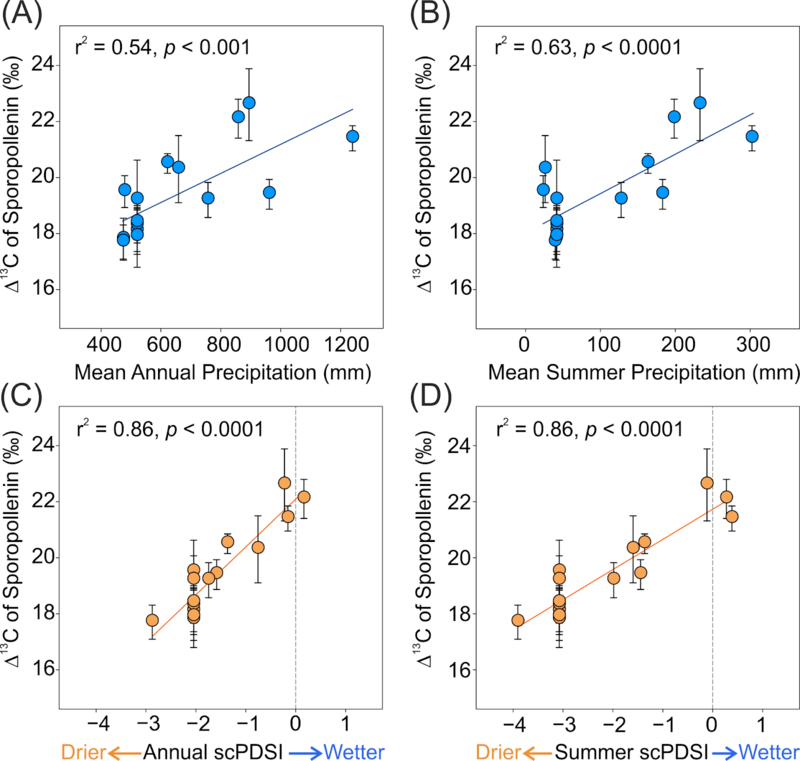 We found that Δ13C in Atlas cedar pollen increases with increased precipitation (both summer and annual), and it decreases with increased levels of aridity (summer and annual scPDSI). Using these modern relationships, we can reconstruct past climates and environments from stable carbon isotope analysis of fossil cedar pollen. You can read more about the modern stable carbon isotope analysis in Bell et al. (2017) (open access). All of the raw data used in this study is also available with the paper. Our most recent and still ongoing work is the analysis of isolated fossil cedar pollen from two cores in the Middle Atlas, Morocco, which span the past ~10,000 years. Approximately 4000 cedar pollen grains (for each sample) have been isolated from other organic materials, and analysed. For comparison, we also analysed concentrated pollen and organic material, and bulk sediment samples. Early analysis shows corrected Δ13C of Atlas cedar pollen from the early-Holocene was higher than it is in modern Atlas cedar pollen (sporopollenin) samples. 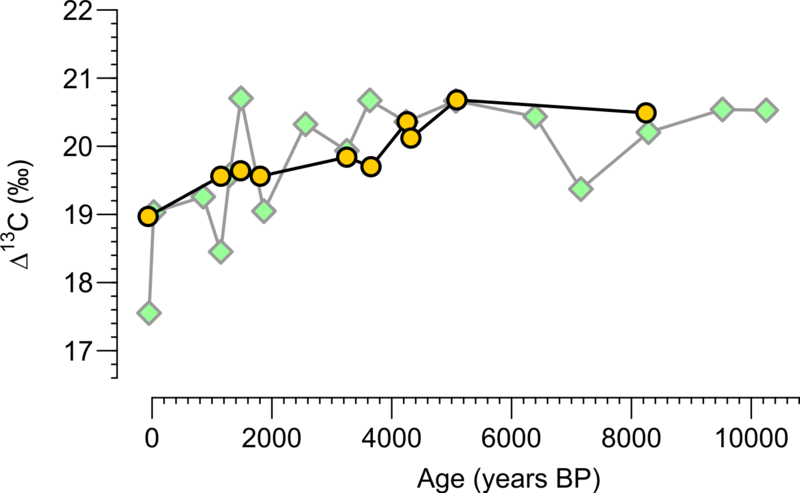 This suggests that in the early-Holocene, the region was wetter and warmer than it is in the present day, and there is a general trend of drier conditions towards the present day. Isolated fossil pollen shown as yellow circles, and concentrated pollen and organic material shown as green diamonds. A paper is currently in development for this work, so keep an eye out for future updates. All of the raw data will also be available with the paper. All isotope analysis was carried out at the Centre for Ecology & Hydrology (CEH) in Lancaster, UK. The biggest challenge facing stable carbon isotope analysis of fossil pollen is that it takes a lot of time and labour to prepare the samples. Another problem is that chemical treatments used in the traditional method of preparing pollen can contaminate pollen grains with carbon, and alter their geochemical signal. A new method was needed to concentrate cedar pollen grains so that they can be more easily isolated. Most palynologists will be aware of the standard acetolysis method for preparing pollen, but may be less aware of methods using micro-sieving and sodium pyrophosphate washes (Heusser & Stock, 1986), and density media separation (Nakagawa, 1998). We combined and adjusted various parts of these different methods (after much trial and error!) into a new procedure for the concentration of cedar pollen grains. A flow-chart describing the steps is below, or you can read a more detailed description of this method in chapter 11 of my thesis (open access). Isolation of individual grains is the most time-consuming part of the process. We investigated several ways of doing this, including flow-cytometry to automate the process. But, ultimately, the simplest method proved to be the best. Using a mouth pipetting system and a standard microscope (or inverted microscope), cedar pollen grains can be easily isolated, by picking them with the mouth pipette and transferring them to a glass vial. This method is based on the method described in Mensing and Southon (1999) (full text available), and thanks to Alistair Seddon (University of Bergen), for showing how it is done! 4000 grains were isolated, and this was a large target. This number was needed partly due to the sensitivity of the machine used for isotope analysis, but also because we wanted to ensure we had a representative sample. The isolated pollen samples weighed an average of 0.06 mg, which equates to approximately 30 μg of carbon. This target can be adjusted if less carbon is required for analysis. Or, you could take a look at a method which uses much fewer pollen grains! Hopefully, future work will expand upon these methods and produce longer records of climate change, as well as isotope analysis on different pollen grains. Thanks for reading, please leave any comments of questions below. Stable carbon isotope analysis of Cedrus atlantica pollen as an indicator of moisture availability - My paper investigating the relationships between moisture availability and the stable carbon isotope ratio of modern pollen. 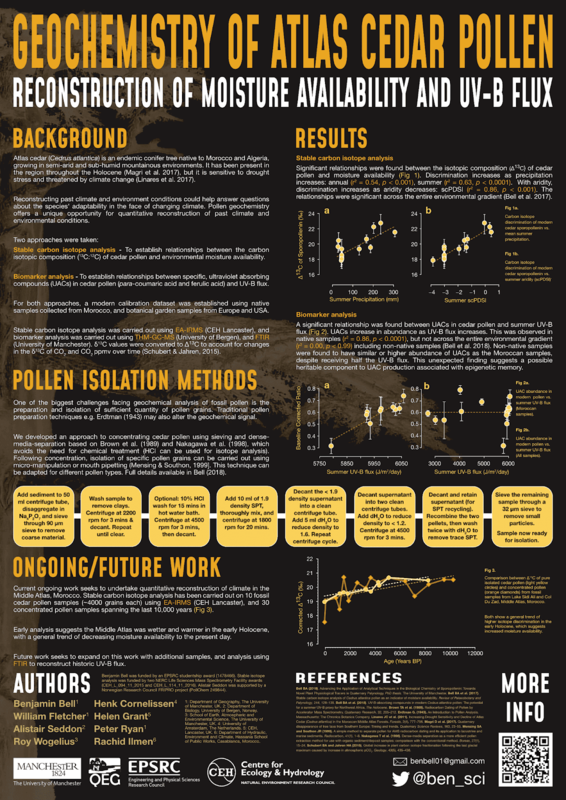 What is pollen geochemistry? - Previous blog post discussing pollen geochemistry and how it can be used to tell us about UV-B levels.